Princess Beatrice of Spain [1884-1966]; purchased 1932 by (Duveen Brothers, Inc., London, New York, and Paris) possibly through King Manuel of Portugal [1889-1932]; sold 1940 to the Samuel H. Kress Foundation, New York; gift 1943 to NGA. The Duveen prospectus, in NGA curatorial files, states that the sculpture was purchased through the intermediary of King Manuel of Portugal. Duveen's Paris branch cabled the New York branch on 7 March 1932 that the bust had been shipped to New York that day. See Duveen Brothers Records, accession number 960015, Research Library, Getty Research Institute, Los Angeles: Series II.A. 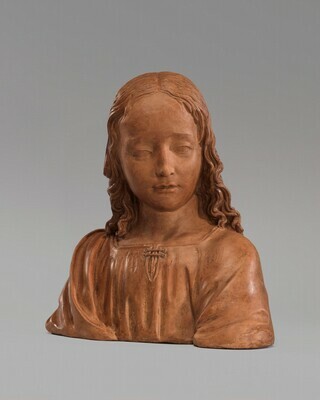 Files regarding works of art, reel 137, box 282, folder 17: Della Robbia, Giovanni: "Bust of a Boy, St. John," ex Infanta Beatriz of Spain; copies in NGA curatorial files. Eighteenth Loan Exhibition of Old Masters: Italian Gothic and Early Renaissance Sculptures [cover title: Italian Sculpture 1250-1500], Detroit Institute of Arts, 1938, no. 66, repro. Preliminary Catalogue of Paintings and Sculpture. National Gallery of Art, Washington, 1941: 233, no. A-48, as Bust of the Young Christ. Book of Illustrations. National Gallery of Art, Washington, 1942: 254, repro. 234, as Bust of the Young Christ. Duveen Brothers, Inc. Duveen Sculpture in Public Collections of America: A Catalog Raisonné with illustrations of Italian Renaissance Sculptures by the Great Masters which have passed through the House of Duveen. New York, 1944: figs. 175-177. Paintings and Sculpture from the Kress Collection. National Gallery of Art, Washington, 1945 (reprinted 1947, 1949): 189, repro. Middeldorf, Ulrich. Sculptures from the Samuel H. Kress Collection: European Schools XIV-XIX Century. London, 1976: 41. Sculpture: An Illustrated Catalogue. National Gallery of Art, Washington, 1994: 198, repro.